Sharif Behruz: Given, the precarious circumstances that the division of Kurdistan in the 20th century has created, Kurdish struggle in each part would not have been possible without some sort of relationship with adjacent states. As central governments have been able to unite against Kurds and use one against another, Kurds have also been taking advantage of rift among states to further their cause. This state and non-state relationship becomes problematic when the particular party in question uses their relations with the state in question against the interest of the Kurds in that part controlled by that state. Unfortunately, in Syria PKK’s relationship was against the national Kurdish movement in Syria, and it is the same in Iran as well. The mere fact that PKK has been able to use the territories between Iran and Iraq as their bases for many years to conduct their fight against the Turkish state, it has been due to blessing and support from the Iranians. Both sides have their reasons for such cooperation, but certainly it is not in the best interest of Kurds in Iran, mainly the political parties. Sharif Behruz: As you are well aware, the situation in the Middle East is very volatile. Strong and stable states have vanished. Kurds in Syria were rarely known to the outside world, but now it is no longer a question to be denied. Iran can be one of those oppressive states that can crumble from within. Kurds in Iran have always played a major role in the transformation of Iran since the creation of modern state in 1920s. They still continue to play the same role through their experienced political parties which are banned in Iran. They political parties, PDKI including, play a significant role in shaping public opinion in Kurdistan and across Iran. The recent unrest in Mahabad proved that Kurdish people in Iran are ready for such an uprising if supported and well organized. This is done by maintaining their link with their constituents. PDKI, despite many regional obstacles has been able to move back and forth between their bases in Iraqi Kurdistan and Iranian Kurdistan. Such movements would definitely be easier if bases are closer to the border as they once were in Qandil Mountains where PKK is right now. However, PKK has forces along major routes and areas where such border crossing can take place, and unfortunately, PDKI has avoided such altercations by taking more dangerous routes. It is important to know that PDKI and PKK as two political parties can and should coordinate their activities to avoid tensions however, PDKI or no other Iranian Kurdish political parties should take permission from PKK or anyone else of how to pursue their struggle for national right in Iran, especially in the areas that are part and parcel of Iranian Kurdistan. I believe it is the other Syrian Kurdish political parties sense of national duty and the threats of ISIS terrorists, otherwise, we would have seen civil war among Syrian Kurds a long time ago. In Iraqi Kurdistan, even though we have some sort of stability and self-government, it is not much different from the rest. ISIS was able to over-run Peshmarga forces who are still function as political party forces as national professional forces. Most of the Peshmargas on the payroll are two main political party members with little or no proper trainings. Of course in such circumstances hostile forces such as ISIS and others can exploit such rifts and cause irreversible damage to our national unity and cause. Sharif Behruz: PDKI is an Iranian Kurdish political party that since the outset has been advocating and struggling for the right of Kurds in Iran. PDKI does not recruit members from other parts of Kurdistan for the sake of interference in the affairs of other parts. Of course PDKI still believes in the Kurdish people as a nation that deserve like all the other nations a state of their own; however, PDKI is a very articulate and realistic political party. Currently, PDKI is seeking to establish a federal democratic structure in Iran with Kurds of Iran ruling over their own areas. On the other hand PKK started as an ultra-nationalist Marxist political party advocating for an independent Kurdish state in the 80 and 90s. Obviously, their main fight was against the Turkish state, and did little to fight against the other central governments. As mentioned earlier, they even forged alliances at the expense of the Kurds of Iran and Syria. PKK’s ideology has changed since Mr. Ocalan’s capture. They rarely mentions or talk about Kurds, Kurdish right or Kurdistan. They have abandoned their national cause and taken up the totalitarian Marxist agenda and often accuse PDKI and other nationalist Kurdish parties as the stooges of the capitalist system. Following the crisis in the region, PKK was and still is in the realm of Shia crescent, as the top person of PKK, Camil Bayak himself an Alawai Shia claimed in the past. It is unfortunate for the Kurds of Turkey to be on the wrong side of history, and PKK is mainly to be blamed for this. Lastly, PKK, unlike PDKI interferes in the affairs of other parts. 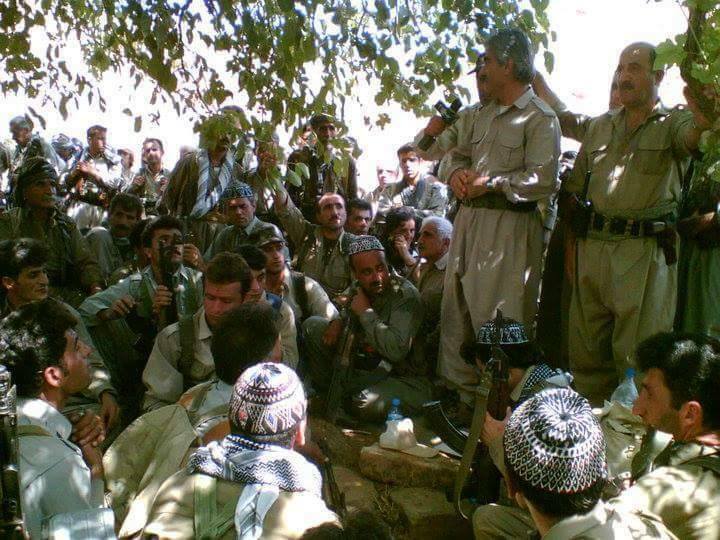 As mentioned they created PYD in Syrian Kurdistan, simultaneously, they formed PJAK in Iran. You know, Bashar Assad left the Kurdish areas in Syria to PYD in agreement, similar arrangement, much hideous however, was done in Iran more than a decade ago to have PKK guard its borders, through PJAK, even though they pretended that PJAK was actually fighting the Iranian government. Iran was and still is of the leverage the traditional and pro-western Kurdish parties such as PDKI, and they were ready to do anything to undermine their popularity, which were successful to some extent.